How It’s New York: Ardal O’Hanlon came to town to participate in The Craic Festival, a NYC-based film and comedy festival. 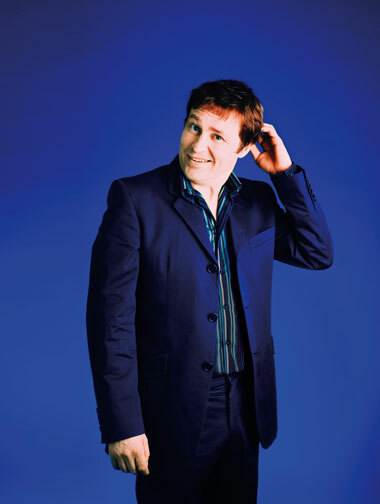 How It’s Irish: Ardal O’Hanlon is from Co. Monaghan, and starred in the quintessentially Irish sitcom Father Ted. A few months ago comedian Ardal O’Hanlon, was here in NYC for The Craic Festival. Mike Fitzpatrick talked to Father Dougal, from the “Father Ted” show (volumes will be published about this sitcom in years to come, I have no doubt), as he got ready to perform stand-up here in the Big Apple. Ardal, Mike discovers, has some serious tastes: his favorite movies includ Apocalypse Now and The Godfather. An earlier version of this interview was first published in Irish Examiner USA, Tuesday, Nov. 13. If one were to think of the most quoted, loved and imitated characters from the Irish (or indeed ‘Oirish’) imagination, there’s no doubt that figures such as Darby O’Gill, Captain Boyle, Dorian Gray, Jimmy Rabbitte Sr. and Leopold Bloom would figure prominently. Then of course, there’s Father Dougal McGuire, the man who brought the Travel Scrabble for when they were traveling, and the normal Scrabble, for when they arrived, though now that he thought of it, he didn’t bring either of them. Created by Arthur Mathews and Graham Linehan, and brought to life by the then little-known stand-up comic, Ardal O’Hanlon, Father Dougal, from the incredibly popular sitcom Father Ted, will go down in comic history as a truly unforgettable individual. Since the show’s three season run, Ardal has gone on to become one of Ireland’s greatest comic exports, starring in five seasons of British sci-fi sitcom, My Hero, taking on several roles in films such as The Butcher Boy and The Adventures of Greyfriars Bobby and also forging a successful writing career. It is stand-up though, where the County Monaghan native thrives however, and New York is fortunate enough to host Ardal (and fellow comic Kevin Flynn), when he headlines the 3rd annual Craic Comedy Festival, sponsored by Tullamore Dew Irish Whiskey and Con Edison on Friday, November 16th. What would you like your own tribute act to be called? Ardal’s Folly (although that sounds more like a trad band). I howled laughing recently while reading Kevin Barry’s short stories, ‘Dark Lies the Island’. James Brown. I just feel he might have loosened something in my bones (I’m a dancer trapped in the body of a tree). Ireland, Leeds United and Barcelona. The late 18th century – American revolution, French Revolution, United Irishmen, excitement, new ideas, opera in the evenings, horseback, duels, I mean, c’mon. ‘Into My Arms’ by Nick Cave, a love song, and a prayer for the secular age. Seventies of course – Led Zeppelin, Leeds United on top, The Godfather (1 and 2), The Deerhunter, The Clash. What movie role would you like to have played/play? I’d like to been in any Preston Sturges movie. I was mistaken for Willem Dafoe in a bar in LA, and for Denis Leary on a couple of occasions. The truth is probably ‘Abba Arrival’ but I prefer to remember ‘Germ Free Adolescents’ by X Ray Spex. ‘Fairytale of New York’ by Shane MacGowan. Possibly Shane MacGowan. As well as being an incredible poet of the night, he appears to be utterly indestructible. Alternative country – Will Oldham, Smog etc (but I am a happy person, honest I am). I’d like to play 5 a side with Lionel Messi. New York writer Don DeLillo is worth revisiting for his wit and perceptions. I also have a quirky book at home called Dutch Fields, which is simply a collection of photographs of Dutch soccer pitches by a guy called Hans Van der Meer which always brings a smile to my face. Father Dougal McGuire, I suppose, as he remains a part of me although I do share the exasperation of Larry David. Apocalypse Now; Fargo; and Elf. Peter Griffin (from Family Guy). Beijing, for its amazing attractions (Great Wall etc) and its even better street-life. Who’s your favorite character from literature? Holden Caulfield (from The Catcher in the Rye).